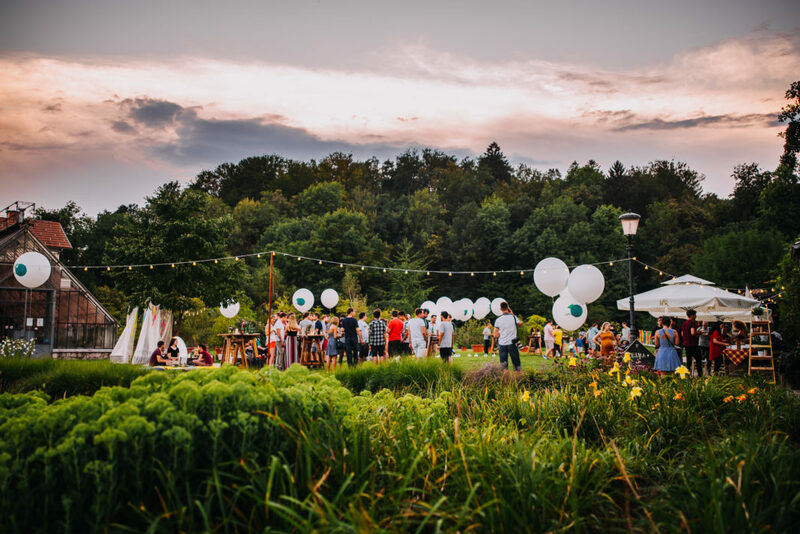 On 27th July, Ljubljana’s Tivoli Park was the venue of the already established and traditionally accepted Celtra Summer Party. Internationally-based company Celtra annually organizes this Summer Party for all employees working all over the globe. The Celtra Summer Party was organized as part of Celtra’s weekly ‘summer gatherings’. Jezeršek Catering created a perfect laid-back set-up picnic in the middle of Slovenia’s capital while utilizing a young and innovative architect Nina Štajner. Celtra is a new innovative IT company with offices expanding all the way from New York to Ljubljana. Each year in the last week of July, a laid-back gathering is organized for their employees, a colorful team of young creative workers. Appropriately presenting Slovenian culture by giving their patrons a top-class catering experience as well as emphasizing socializing with a casual and laid-back accompanying program, Ljubljana’s team had their work cut-out for them. The theme of this year’s summer party was an urban picnic held at the Tivoli’s boathouse Čolnarna Park Tivoli. There was an abundance of picnic blankets intended for mingling on the meadow, guests were able to enjoy a game of badminton or soccer, and children were able to enjoy face panting workshops where animators gave their faces terrific make-overs. While the guests were enjoying themselves participating in different activities, excellent culinary animation was Jezeršek catering’s domain. Execution of a well-known delicacy from Serbia – leskovački čevapčiči, lamb kebabs, Mediterranean style stuffed bell peppers and a variety of fresh salads were made to taste. All this additionally spiced-up the casual feel of the gathering. Every year the party is concluded by a performance by Xequtifz, and this year was no exception.